Streams & Currents is the next compelling step in the direction begun on his best-selling Midnight Moon (Projekt 2000). Utilizing the guitar as a painterly tool, Steve’s continuing evolution of atmospheric processed guitar-based zones provides an evocative complement to his many influential albums of synth-based soundworlds. Full of nuance and subtlety, built from webs of melody and pure texture, Streams & Currents is imbued with an ephemeral quality that seems to linger at the edge of conscious perceptions, creating an introspective, enveloping flow of mood-altering pieces. The album progresses to deeper, darker and warmer zones, growing quiet in a way that is beautifully chilling in its nearly submerged ending. The mercurial ebb and flow found within Streams & Currents creates a kind of sanctuary that is rarely found in today’s music. 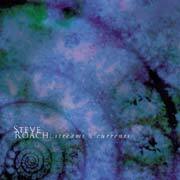 In his own silent way, Steve Roach has created the perfect atmosphere for contemplation and dreaming with eyes open. For over two decades, Steve Roach — as composer, producer and performer — has constantly challenged himself while fulfilling the need to create powerful sonic spaces. His music has an uncanny ability to shapeshift into new forms and ancient spaces simultaneously. This dedication to his art has been captured on over 50 solo and collaborative releases over the past 20 years. These influential works have inspired a new generation of electronic artists, established a steady list of benchmarks in the vast world of Ambient-Electronic arts, and defined an intensely personal sound that speaks to a dedicated and growing audience worldwide. Streams & Currents is the result of a steady flow of deeply inspired late night sessions between late August and Mid-September 2001. Of my pieces, I feel these are perhaps the most intimate and directly expressive of ‘being in the present moment.’ As the CD evolves, a sense of quiet seems to engulf the tracks progressively; it is something I have never quite captured before in this way. If there is a theme to be found in this recording, it’s about working from an instinctual place – starting from an empty slate state of mind. These pieces began like the zones on Midnight Moon, in a relaxed and introspective state with everything recorded live in the moment in the Timeroom Studio. Almost every night, the need to engulf myself in this deep-quiet warm blanket of sound became a temporary obsession that soon filled over seven recorded hours. Instrumentation consists of two electric guitars, (Stratocaster and Baritone Guitar), Ebow, extensive live looping and sound processing gear along with mantra beat on one piece. After several recent ‘everything goes’ projects, Streams & Currents was also about focusing on minimal-essential technology to bring out the maximum opportunity for subdued emotive expression. Since Midnight Moon, I have been increasingly drawn to the physicality of playing the electric guitar in a textural-layered melodic mode. The feeling of caressing the sound into form with the help of an array of real-time processing is the core of this experience. During the summer of 2001, I dedicated more time to the guitar, experimenting and learning more in my own way and just having fun with the whole thing. As I gathered these soundscape pieces, it became clear that a connected current was running though them all. At first I thought I might include some of these on Mystic Chords & Sacred Spaces, my work in progress; however by the end of September it was clear that the atmosphere they were creating was better served by keeping the pure interconnected feeling of these pieces intact. The idea that this music would be my next release presented itself naturally. It’s all part of the ebb and flow; being available to the streams and currents of the present moment. Steve Roach is an artist who works intuitively and instinctually, and STREAMS & CURRENTS comes closest to capturing the soundscapes that drift through his mind in his most introspective moments. As a continued exploration of – and not a sequel to – the guitar-based atmospherics first heard on MIDNIGHT MOON, Roach has created an album that compels the listener to reach into the subliminal darkness, to swim in a realm of passive thought. As a radical departure from the percussive power of Roach’s tribal electronics, STREAMS & CURRENTS is a unique work that evokes a space of contemplative silence.